Here’s a few ideas for activities and attractions in the Glencoe area that will appeal to all the family. Pop along to the Scottish Segway Centre, located at the Dragon’s Tooth Golf Course in Ballachulish and take the ride of your life on a Segway Tour. Guided Tours will ensure that you’re properly briefed on riding these eco-friendly ‘personal transporters’. They’re slightly daunting to step on to at first, but surprisingly easy to master. Within a few minutes there will be a big grin on your face and it’s off and away around the estate. Great scenery, great views, great fun! 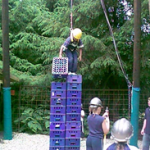 The aim is to build a tower of crates as high as you can before it topples and comes crashing down. The challenge is that at least one team member must be stood on the top of the tower. The whole team is involved with building the tower and need to work together to support it and pass more crates to whoever is on the top. A great team building activity! For more ideas, or to book some of the activities described here and elsewhere on our See & Do pages, see the Glencoe Activities web site. The National Trust for Scotland Visitor Centre is well worth a visit. See the interpretive displays about the history and geology of the glen. There’s also a shop, cafe and information point, along with several easy trails through the local woodlands. In addition the NTS also provide Landrover Safaris; a great way of exploring the glen and seeing some of the more difficult to reach parts. They are provide a wide range of guided walks, both at low level with varying themes looking at flora and fauna, and also some higher level walks. 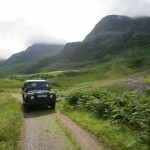 Just a few minutes walk along the road Keith at Go Glencoe offers guided walks for all levels of experience and fitness. See also our Wild Glencoe page. 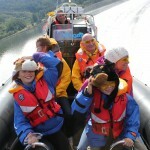 Hold on to your hats and enjoy the exhilaration of a ride on a fast RIB on Loch Leven with SeaXplorer. 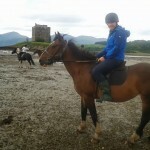 Launching from the pier in Ballachulish, this is more than just a fun ride. SeaXplorer and their knowledgeable crew will provide a completely different view of our scenic landscape. Get closer to Eilean Munde and learn the history of the Burial Isle. Learn more about the fish and mussel farms and see the thousands of salmon close up. And watch the wildlife at close quarters, with seals, herons, divers and more being regular sightings. Finally, pull in your own creel and see what the catch of the day is! 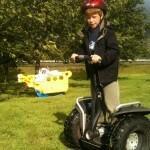 SeaXplorer provides an exhilarating and fascinating experience for all the family. Take a trip through Glencoe to Scotland’s longest established ski centre, Glencoe Mountain Resort. Take a ride on the mountain chairlift and walk to the viewpoints giving the most spectacular views across the dramatic expanse of Rannoch Moor. Alternatively hire a bike and explore some of the easier moorland tracks. They also have some very hard Downhill Mountain Bike Tracks accessed via the chairlift. Alternatively, try Torlundy Farm, just north of Fort William, with spectacular views across the Great Glen to Ben Nevis and Nevis Range. 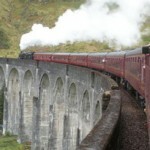 Take a trip to Mallaig on the Jacobite Steam Train from Fort William. The line has always been popular but has become even more so since it was featured in the Harry Potter movies. The viaduct and view of the Glenfinnan Monument must make this one of the most photographed railways in the world. Try this short You Tube video to wet your appetite for a ride on the Jacobite. Steam Trains run from May until October. A day trip to Oban is a popular choice when visiting the area, especially with children when it takes in the Sea Life Centre or the Cruachan Underground Power Station. Trips to Oban usually include a visit to the Oban Distillery. Or perhaps hire a bike and ride round Loch Leven. The roads are fairly quiet, although it will include a short stretch of the busy A82 is you do the whole circuit, though this is now mostly avoided by using section of the new cyclepath. The full circumnavigation is a shade under 20 miles. Try biking on the north shore from either North Ballachulish or Kinlochleven and enjoy a seafood lunch at the Loch Leven Seafood Cafe. See our biking pages for more biking ideas in Glencoe, Fort William and throughout Lochaber.